1. Place specimen slide on microscope stage and secure with clamping arm. The slide is properly in position if turning each of the the stage adjustment knobs moves the slide appropriately. Position the 4x or 10x objective into place. It will click when it is properly positioned directly over the slide. Make sure that there are several inches of clearance between the glass slide and the lens. 2. Using the stage adjustment knobs, position the edge of the coverslip in the center of the illuminated area. 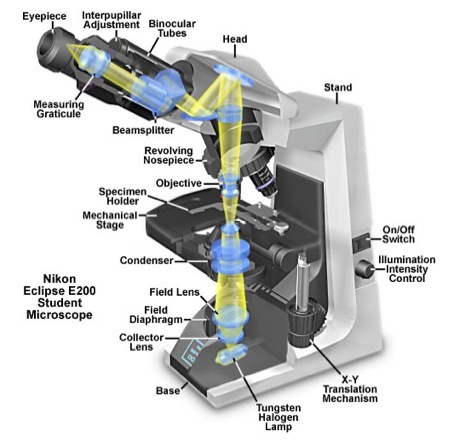 Look into the microscope and adjust the eye pieces so that you can see one image when you use BOTH eyes for viewing. While looking through the oculars and 4x or 10x objective lens, rotate the course focus knob slowly so that the distance between the slide and the objective lens is reduced. When you see the black line that indicates the edge of the coverslip is coming into focus, switch from the course to the fine focus adjustment and bring that "black line" into sharp focus. Switch to the 10x objective and refocus. Use the stage adjustment knob to move away from the edge of the coverslip into the area where your specimen is located. Find the specimen and focus it using the fine adjustment knob. 3. To increase the magnification of the specimen, rotate the nosepiece to the 40X objective lens and focus using the ONLY the fine adjustment knob. Never use the coarse focus knob when you have the 40x objective in place. 1. Familiarize yourself with the Lab wiki and bookmark it on your computer. 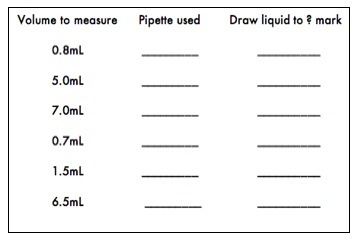 Read material relating to course assignments and lab attendance, as well as instructions about lab notebooks in the Introduction To Cell Biology page and in the Resources section. Be sure to familiarize yourself with the safety information (also found in the Resources section). This page was last edited on 10 September 2010, at 09:30.